I thought I'd do another round up of a staple item every guy should have in his wardrobe. This time I wanted to give a run down on the must have shirts every guy should own. I have around thirty to forty, but these are a brilliant starting place if you're looking to start shaping a capsule or new wardrobe. Whether you're the type of guy to wear a suit to work each day or if the only time you wear a tie is at a distant relatives wedding, every guy needs a formal, white shirt. It has plenty of uses and getting the cut and detailing right can make the difference between looking sharp and sloppy. Nobody wants to look like they've borrowed their dad's suit so why should it be the same for the shirt? Go for a slim-tailored fit and add some cuff-links that match your taste. In the summer, team it with a pair of chino's for a more relaxed look and maybe drop the tie for a smart-casual appearance. 1: £30 Topman | 2: £45 H&M | 3: SALE £90 GANT | 4: £20 Topman | 5. £45 Moss Bros. Looking for a more stylish and rugged shirt? The denim shirt is here to help. 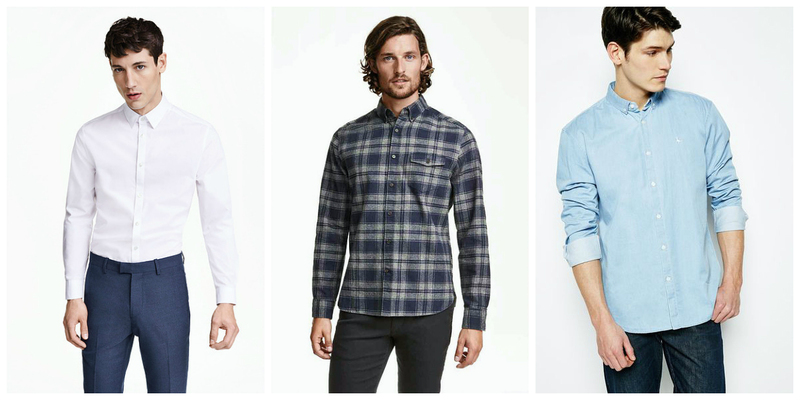 Choose from a variety of washes, denim shirting has made a comeback and is here to stay. It's just as wearable to a formal occasion as it is to decorate in. Ranging from chambray to thick, hardened cotton, the range in finishes and detailing is really down to personal preference. I have a number of different ones and the thicker options make them a great alternative to a jacket and are easy to wear as an overshirt. TIP: Pair the thinner, lighter options with a tie and blazer for a stylish alternative. Probably the most versatile of my choices, the checkered shirt covers a wide choice of colours, pattern and fabrics. Whether you decide to go for a large check, flannel number of keep it classic with a simple gingham, the checkered shirt is always a firm choice. Go as loud or as muted as you want and choose from a selection of thickness's. Depending on your choice, be careful to not look like a lumberjack if that isn't the look your going for. I find that the smaller gingham shirts give a neater and smart finish and the bigger, flannel options are great for casual and weekend wear. Similar to it's classic brother, the light blue oxford is a must have for any guy. Long gone are the days of the 'blue collar' being inferior to the white, as this alternative shade offers as much sophistication as any other before. The fresh colour does lend itself to the sunnier months, but is a great layering piece all year round. Team it with a pair of sand chino's for a preppy look or throw it on with a pair of grey trousers for that midweek business lunch.